Looks like the "Black Ops" idea was supposed to be funny, at least I hope so. This is a crowd I'm not really familiar with, they do seem to take things more seriously than a skeptic crowd would. I would seriously be pissed if someone was not allowing me outside when I needed to be outside, seems that there should be more oversight and maybe more evidence than one man getting pissed off that his wife could not go out. Yes, apparently Wilcock is building up a huge following from his books & media appearances. I don't know a lot about him myself. Are you telling us that you edited his Wiki page? It looks good. Now it needs a photo. I don't have one. Typical Greer theatre, unintentional comedy. In nearby Palm Springs! I'm sure it was intentional. With a name like that, how could Greer NOT employ them? "Black Ops Protective Agency is a full national firm especializing...."
English not their first language, I'm guessing. And thanks for including the shot of Douglas Taylor's "Pleiadians" mural. That is a Scream! What is that, Flying Saucer folk art? "UFO" Psychedelic outsider? Kosmic Kook Kitsch? "Mentally traveling with an open mind and an adventurous heart we can perceive the reality of a civilization that has been evolving positively for literally millions of years. A society based upon an advanced scientific development that integrates technology and spiritual awareness in a synthesis of pure creative expression." Yikes! Could he squeeze another new-age buzzword into that kooky appeal? "Quantum?" Well, something happened to Doug on his "trip" back in the 1970s, but I doubt very much that it was a meeting with visitors from the Pleiades. Our benevolent space brothers indeed. They are really concerned about us! Besides being lost in new-age time warp, there's something dark and ugly, even misanthropic, under all that colorful gloss. Heaven's Gate ring a bell? Well, at least they protect "dicnitaries". Is that write-up on their site supposed to create a sense of professionalism at work? I nearly got buzzword bingo from Taylor's spiel. I just needed synergy and higher consciousness. Coming next year so order your tickets today! A glorious weekend of being held against your will in an overcrowded and stuffy conference room where you will be forced to listen to speakers rambling on topics they talk about at last year's conference. Sherwood Lovett - "The Pleiadian's Initiative for Peace and Prosperity for Earth." 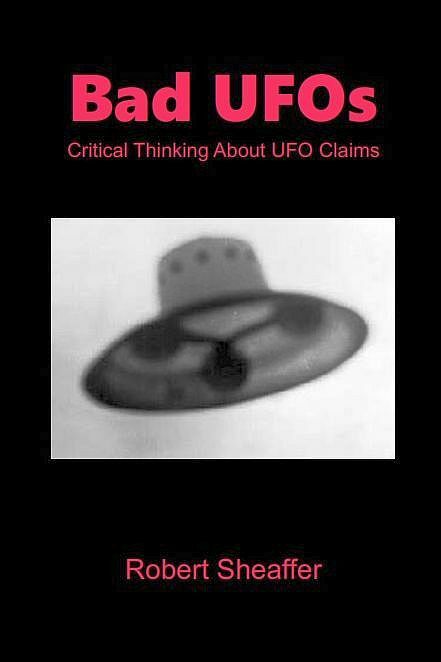 Fanny C. Prone - "How Time-Traveling Ancient Aliens using Stargates and Mystical Crystals from Atlantis contacted Shirley MacLaine's Mutilated Cow in a Crop Circle." Lou P. Theery - "50 Shades of Grey - Understanding How the Grey Alien Reproduce." Hugh Rection - "How To Meet Hot Pleidian Women." "Bruce Almighty" - Morgan Freeman impersonator. There will be a Meet and Greet with representatives from the Pleiadian Interplanetary Lovey-Dovey Rainbow Council. Photography or ogling the Pleiadian women are not permitted. Do you need to look IMPORTANT at your next UFO conference? Do you want to generate DRAMA for your UFO presentation? Do you feel threaten by skeptics asking uncomfortable questions? Palm Spring's “Black Ops Protection Agency” Community Theatre. Our "security" acting services are dedicated to make an IMPRESSION at your next UFO event. Our staff are highly-trained and under-employed actors that will look and act like intimidating bodyguards just like in the movies! We will guarantee that you'll have a "captive" audience at your next UFO lecture. Our motto - Your Ego is Our Business! OK, this one is pretty funny. All I knew about Wilcock was that in the lead up to 2012 he was claiming that after the 21st of December 'anyone' would be able to perform what amounts to magic. This quote from the Exposing PseudoAstronomy podcast says it all. "For example, on August 17, 2004, David Wilcock, the man who thinks he's the reincarnation of Edgar Cayce, claimed that after December 21, 2012, we would be able to levitate, rewind time, and do instant healing ... among other things. The last time he was on was in May 2012, though he used to be on several times a year." At least the street address of the Palm Springs "Black Ops Protective Agency" appears to be a plausible office for a small business, near as I can tell from Google Street View. The website for the "Black Ops Agents" is incredibly amateurish. What did you expect from all these impostors, the Truth? Laughable FOOLS! Is it not obvious to everyone yet, that pretty much everyone on that speaker's list, has been spewing the same old crap for many years now? And that virtually nothing of what they've claimed has added any significant value to the world, or that none of it has ever come to be? Especially the two posers mentioned in this article! Whew! 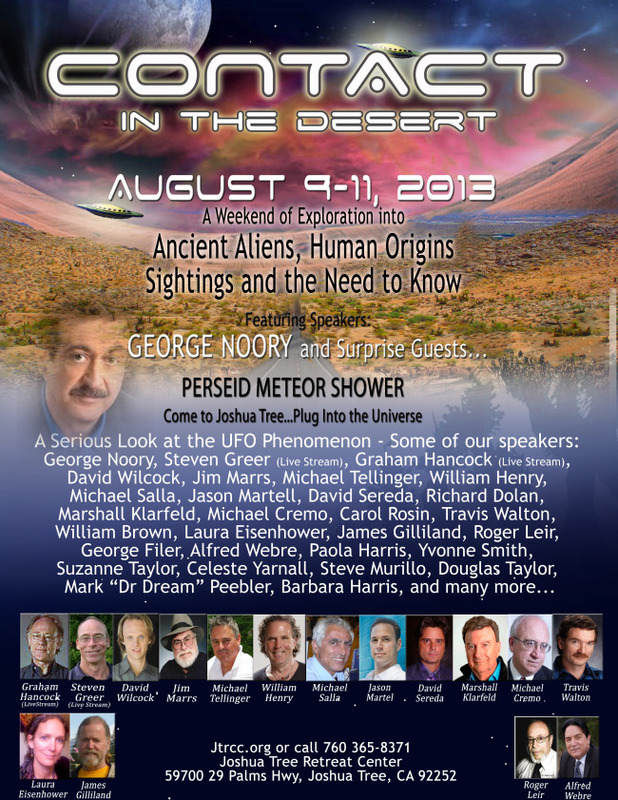 I recently spoke with a couple at the San Diego MUFON meeting who had attended "Contact in the Desert." They confirmed hearing William Henry hollering and banging on doors, but couldn't add any more details. Record last updated on 22-Jun-2013. The owner isn't necessarily Canadian: they just paid for a privacy service based out of Canada. The whole point of the privacy service is to hide who paid for the domain name; this is a common thing and most people use it for non-nefarious reasons. 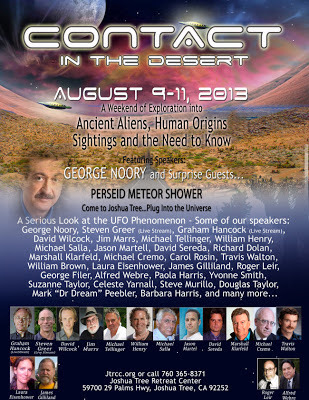 Look what I found on YouTube: Steven Greer's lecture (indoors) at the Joshua Tree conference center on Aug. 11, 2013. Does anyone that visits this site actually seen what Micheal Tellinger has found in South Africa? He has called it "Adam's Calender". A stonehenge like structure atop a cliff , which dating estimates 200-100 000yrs old. The surrounding countryside is riddled with stone bldgs,roads & terraces which can be seen from google earth. Was this mans first civilization? Current archaeologists dismiss it as a 1200AD creation of bantu people or the stone kingdom built 1000s of miles away. Surely this requires further investigation especially since genetics have determined that we all descend from "Mitochondrial Eve" . Modern man, homo sapiens sapiens, evolved in Africa 200 000yrs ago & started a mass migration around 60 000yrs ago >"Out of Africa Theory". Alas, if it doesnt agree with mainstream archaeology, its ridiculed!! Jim Marrs is a well respected journalist & author. He even draws the line at the so called "lizard people". But you have to wonder where theorists get their ideas from. Since this blog has centred around the "black ops security" of Greer, for those of you who havent seen this ,take a look at "PsyOps Patches". Not the army battalion level patches, but the world of "BLACK PSYOPS". Thats the trillions of money that dissapears in the budget each year> glad to know they all have their own little mission patches!! A lot have got to do with NOR(spy satellites) & space missions. With pictures of an alien face,dragons clutching the earth, snakes entwinining the globe, illuminati pyramids with "all-seeing eye",devils.occult themes, wizards with lightning bolts & celestial features. Names in latin, "All your bases are ours", "If we told you,we'd have to kill you", & my favourite depicting the moon>NOYFB(none of your F***ing business). Maybe Jim O , knowing so much about all things space , could shed some light on the matter? One mentions control of national-air breathing? Has that got anything to do with chemtrails????? Who would they be trying to scare or intimidate? The public doesnt get to see them. Maybe the rocket scientists ,physicists & astronomers working on the projects? Is this why NASA has delayed images? The internet is a real worry to the black ops world, because the information cant be controlled. The panic caused by Snowden, Wikileaks & Manning have proven this. I can also remember a UK hacker called Gary McKinnon. Still trying to be extradited to the US. He hacked into NASA & found a site listing "non-terrestial officers" & US ships, not with the navy!! Maybe he had found one of these "BLACK PSYOP" space squadrons, also on one of these very, very mysterious PATCHES !!!!!! Where is everyone? Have you all been furloughed? Do you trust your govt now? Bonehead & Obummer arent gunna budge on this little fiasco fellas- its been planned for years> Collapse of U$ dollar !!! Napolitano has just abandoned ship at the thought of it all. All your military troops are overseas> they wont fire on US civillians. Police, DHS, TSA & Foreign troops will be the stormtroopers in black armour. Billions of rounds of ammo ? MRAP personnel carriers ? Boxcars with shackles & handcuffs ? Plastic coffins ? FEMA camps & millions of Ration Meals & Water packs ? Dont forget those GUILLOTINES approved by that senator so body organs arent affected. There is now video & document evidence all over the net that confirms all of this or do you still only watch FOX & believe the msm. Alternative media exposed Benghazi & thus delayed Syria, but the main distraction now is this sideshow "Give me a call" in Washington. Obamacare will still go through to "chip" the masses but dont tell them you own a gun on the form > Gun control is part of the collapse as well. Sandy Hook & Navy Yard more propaganda, buy-back & amnesty, but eventually they will come knockin down the door to get rest. Surely you must have suspicions of your "couldnt lie to me " govt, after all the NSA dealings with Manning,Assange & Snowden > they tried to warn you! I hope none of you end up in the FEMA camps watching "dissidents" of the NWO getting beheaded by the guillotine. Because they lie like a cheap rug, maybe that comet ISON is the natural disaster Naplitano is warning about. Can you TRUST anything they say? I for one am hoping our space-brothers come to the rescue of planet earth. There is a phenomenon of UFOs in the skies. There is a phenomenon of Cropcircles. There is a phenomenon of Cattle Mutilations. A labotomy doesn't count as a scoop mark. I just wanted to add this: anyone who has worked as an usher for events will understand the concept of a 'lock out'. This is where the presenter requests that anyone arriving at the venue after a certain amount of time will be 'locked out' from entering the performance, even if they have paid for tickets. The basic idea is that after a certain amount of time, the late audience members will have missed important information; late entry distracts the performers and the audience; it causes miscounting of heads in case of emergencies, or difficulty in seeing where you're going; etc. Some venues or presenters will have specified entry points - that is, you can enter during a scene change, or at specified times/points in the performance, for minimal interruption. Now that's said: what these guys did is nowhere near the same. It's like they took this common idea and then ramped it up with their own particularly perverse version of it. This would most certainly be against any kind of OH&S that venues have to follow (if nothing else, they're blocking emergency exits), not least of which preventing people from leaving is in general against the law in most places. Absolutely despicable security theatre for no purpose other than to 'impress' the simple folk. If the hired goons were actors, then they are certainly not professionals and certainly never had to work the door before. And anyone who attended should notify the venue that they need to better supervise their space. I feel if any of you had a major serious death threat leveled at you of the kind that David Wilcock experienced after he disclosed highly sensitive material, and then you had to go out into public onto a stage, you would be showing up with body guards and bomb-sniffing dogs as well. Look it up. He has never been the same since, he admits that. Open your minds, people. These folks, all of the speakers mentioned, are trailblazers on a dangerous path, encouraging us to remove the blinders from our eyes. Or laugh it off. Your choice. By the way, I wasn't there, but a lock-out to me seems reasonable if they open the doors every 10 minutes, which it seemed they did. "Trailblazers on a dangerous path"? That was meant to be ironic right? Why would someone that powerful merely threaten anyway? I've always wondered about that one. Great thoughts you got there, about Security Services believe I may possibly try just some of it throughout my daily life.